How do you Gracefully Handle a Wedding Emergency? You Just Do! Recently, I was able to contribute to an article for WhatHappensNow.com about wedding emergencies and boy did I have a good one! Read how my amazing Hidden Garden staff and I pulled off a perfect Napa wedding after ALL the wedding flowers froze overnight. And the bride never knew! Mia & Gabe exchanged vows on the lawn of the Bel Air Bay Club, while their guests peered out to the beautiful ocean. As the sun was setting the guests enjoyed cocktails, which was followed by a night of dinner and dancing. The bride chose a color combination of vibrant orange, yellow, celedone green and pink to mimic the shades of the sunset. 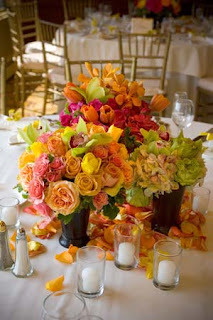 A vibrant array of roses, tulips, hydrangea, and orchids created a stunning and eye catching design. The amazing Vernon T photographed the wedding and caught every amazing shot, take a look at the slideshow to see just how beautiful it was. I received an email today from a rose grower (Absolute Farms) today that I wanted to share with you. Your "passion" for what you do for a living is very obvious to those around you even though you might not realize it. Thank you, Micheal. My very first day in this industry years ago I was walking through a greenhouse with one of the best know Colombian growers, Juan Carlos Leon, and he said to me, Michael, roses are just like people, they have their unique personalities, they open differently, have different life cycles and die differently. They are so sensitive that if I have a worker who is going through a difficult time - a divorce or some life crisis - then the roses in his section will suffer and not grow well (I thought this was B.S. but I actually saw this happen.) The fact of the matter is we are not in the Rose business, we are in the sentiment business. People give flowers to express how they feel, if you have this in your heart and are passionate about what you do and grow to love roses it will reflect on how you relate to people, they will see and feel it. 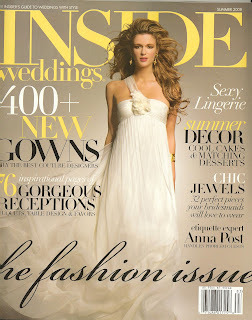 Just wanted to make sure you knew that the Summer 2008 Issue of Inside Weddings is out on the stands now!! As always, there are tons of great wedding ideas for the bride-to-be. 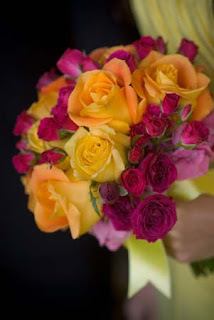 You can also check out my new article on page 228 called "Beautiful Blooms for a Beach Wedding." The Hidden Garden creates a lot of gorgeous outdoor weddings and I compiled some of my favorite ideas for the perfect beach wedding. (A few years ago Inside Weddings featured my own beach wedding in Hawaii.) Hopefully, there will be some inspiring tips for you "Beach Brides-to-Be." As you know....it has been really hot out there! A little too hot for all the beautiful flowers that just aren't used to the high temperatures. I wanted to pass along a few tips on keeping your fresh cut floral arrangements fresher a little longer in this heat. 1. Keep your arrangements out of the direct sunlight in your house. Even if you have the air conditioner on indoors the sunlight beating through your windows can still effect the longevity of your flowers. 2. Mist your flowers everyday if you can. This will keep them cool and happy. 3. Change the water in your arrangement daily. Be sure to add "cool" water when you do this. 4. Add a drop of bleach to the water. When things heat up, bacteria builds up even faster in the water. Keep the water as "bacteria free" as possible to increase the life of your arrangement. If you are sending flowers to someone during the hot summer months, be sure the florist who is delivering has a phone number of the recipient. This is what we do at Hidden Garden - we don't want to leave any flowers on the doorsteps during the hot days. What a beautiful wedding day it was for Amy Wender who had her wedding at Bacara Resort & Spa in Santa Barbara, coordinated by Alexandra. And what a treat for Hidden Garden to design it! The decor was magnificent, with all the flowers in monochromatic magenta & fuschia tones, including peonies, roses, orchids, tulips, & hydrangea. Not only was magenta used in the flowers colors, but also the details including any ribbon or fabric to add special touches. To create the perfect compliment, brown accents were added in elements such as the table linens, chairs, ribbons, and even the coffee beans to hold the place cards. 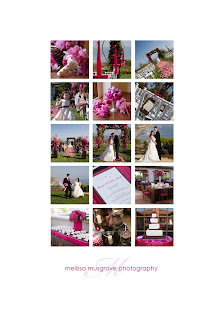 Take a look at the beautiful pictures to the left (click to enlarge) compliments of Melissa Musgrove Photography. Sorry it's been a week since my last post! We have been so busy at The Hidden Garden prepping for our upcoming weddings this weekend! We have one wedding at the St. Regis in Monarch Beach (Laguna) and another at The Bel Air Bay Club. Ironically, both of our weddings are full of vibrant, strong jewel tone colors. I truly love when brides embrace the use of color in their wedding decor. It really makes the flowers "pop"! Your choice of wedding color combinations can really impact the overall tone of your wedding. If you are going for a fun energetic party - go bold and vibrant!! It's a big hit and truly sets the tone for the evening festivities to come. Come back to visit my blog on Monday when we have some visuals and more details about both of these weddings. Peonies are in Season - Don't Miss Them! Peonies really are a remarkable full and lush flower. When you get a peony that is perfect, every petal opens up, creating a flower that is almost the size of your palm. Now, that being said, you have to really know how to pick a good peony. 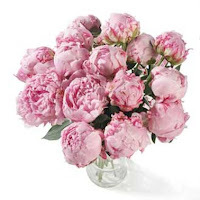 There are many type of Peonies. Local ones, dutch ones, hybrid ones, white ones, pink ones, burgundy ones - the list goes on. They don’t all open up the same. You want to make sure that you pick a bud/bloom that looks like the flower is cracking at the top. If you pick a bloom that is hard as a rock, chances are it will never open. You might think to yourself, “I’m going to get one that is tight, it’ll last longer.” Just remember that if the bloom is too tight and too hard then chances are you won’t end up with that beautiful bloom you have been searching for. Not to mention, peonies aren’t cheap!! So make sure if you are spending the money, you get a beautiful bloom. Monday was off to a great start in New York. My publicist, Angela Moore (Starfish PR,) and I visited the New York Flower Market to pick up our flowers for the Better TV shoot in Central Park. The market was just beautiful . There was an array of peonies, pee gee hydrangea, tulips, roses, hyacinth and Calla lily's ....the list goes on! It was a beautiful spring day in the city. We gathered together an abundant display of blue hydrangea and light pink rose petals for our Central Park Wedding Ceremony segment. We shot the segment at the Southeast entrance of Central Park at the most beautiful pond and rolling hills which overlooked the city. Audra Lowe from Better TV met us there to shoot the segment (along with Field Producer Marianne and Studio Producer Ashley). It was an amazingly gorgeous day in the park. We had a great time and can't wait to share the segment with you once it airs on Better TV. We also had an opportunity to meet with a colleague of Angela's , Peter Shankman, an uber-publicist and creator of Help A Reporter Out (HARO.) We all had dinner at a yummy Mexican restaurant and he later gave us each a copy of his book "Can we Do That." It's all about big PR ideas, stunts and tips that can help any company out. Great day. Long day. The best part? A beautiful bride and groom came skipping through the park following our shoot. Fate? I think so. Sending an extra special "THANK YOU" to the lovely ladies who make Better TV even better, Marianne & Ashley! Can't wait to see you again in the fall. So we are headed to New York for another taping with Better TV (the syndicated show produced by the folks at Meredith Corporation's Better Homes and Gardens.) I’m looking forward to this trip. Our schedule is a little packed for the short duration that we are in New York. Monday morning – rise and shine for the New York Flower Market. I mentioned in the past that they don’t start quite as early as the Los Angeles Flower Market but we will be there around 7 AM. We are going to purchase flowers for a segment that we are shooting in Central Park later in the afternoon. “How to create a beautiful backdrop in an already Naturally beautiful location”. We are going to demonstrate a few simple items that can dress up an already pretty ceremony site. Some simple things like Rose Petals to add color on the aisle, Rose cones filled with floral arrangements to hang from the chair or a simple vase filled with an abundance of Hydrangea (for example) at your ceremonial spot. Monday Afternoon – it’s off to pick out flowers at a New York Deli (basically, LA’s version of a farmer’s market/Trader Joe’s). Better TV will shoot some b-roll footage of me picking out flowers at the Deli and then Tuesday we will be taping a demonstration on how to arrange them like a pro with Audra Lowe, one of the show's awesome hosts. On Tuesday we head to the Better TV studios to tape a segment about “arranging the flowers from the NY Deli”. This will be some quick tips on how to arrange your grocery store flowers like a pro! Your friends won’t believe you actually arranged them yourself. Check back soon, we will be posting this how-to for you to try at home!